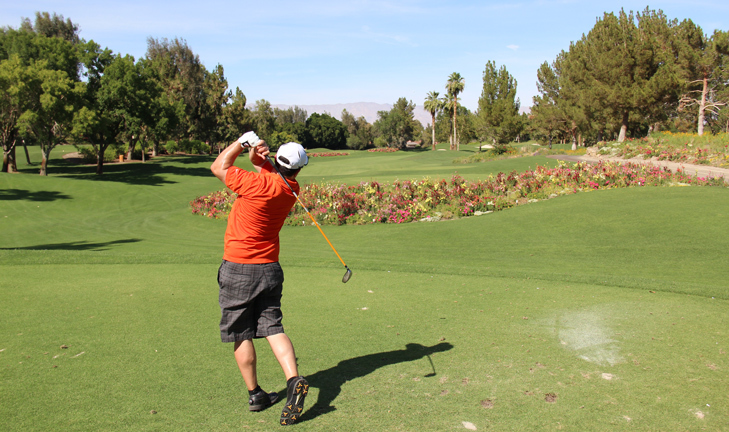 Indian Wells Celebrity Course Hole 1: A pretty easy opening hole, this dogleg left has a lot of flower beds (free drop) that make it a visually pleasing start. 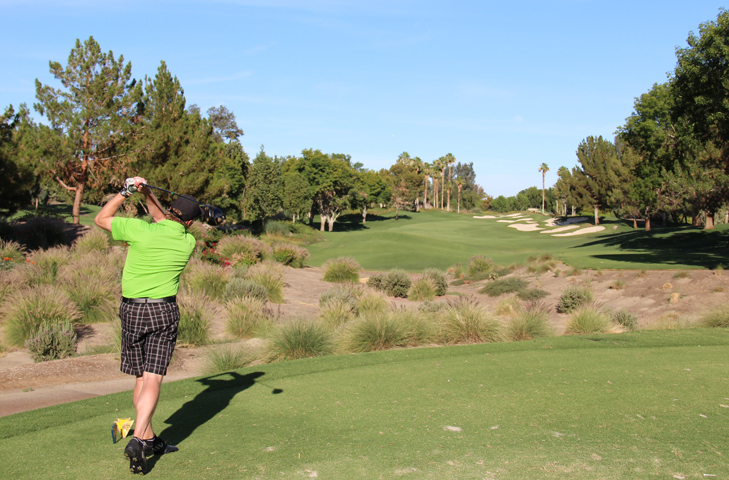 The ideal drive is just left of the trio of palm trees at the corner of the dogleg. The approach is then fairly open to the putting surface. Indian Wells Celebrity Course Hole 4: Not particularly long, and downhill, if the player can find the right line over the bunker on the tee, even with average length, they can consider going for the green in two. However, the hole does feature an island green, which does make that a little more difficult. However, the island is large enough for three bunkers, a few palm trees and plenty of rough, so it's not the tightest shot of all time. Indian Wells Celebrity Course Hole 5: The most difficult hole on the front is this long par four that is uphill all the way. 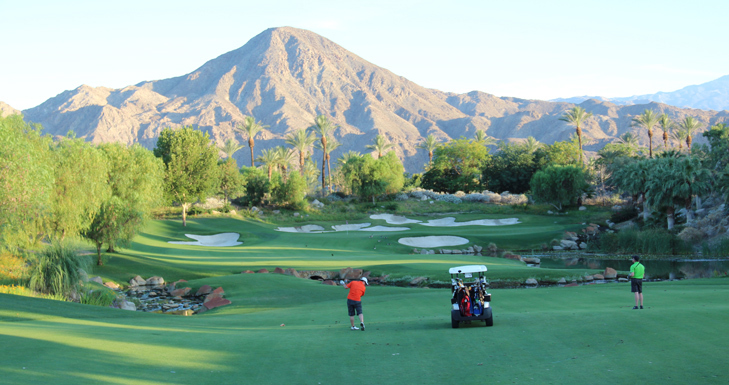 The green also has a slope in front that will keep most run-up shots from making it to the surface..
Indian Wells Celebrity Course Hole 6: Coming back down the hill a little, this par three shows you all the trouble from the tee. Although there is water short of the green, it's a good 15 yards short at least of the green, so the more concerning trouble is the creek right of the putting surface. Indian Wells Celebrity Course Hole 8: This short par four is uphill and has a long series of bunkers down the right side that must be avoided. The fairway is relatively tight, but not a lot of length is need. The approach is uphill to a green that is surrounded by sand traps that really need to be avoided to facilitate par or better. 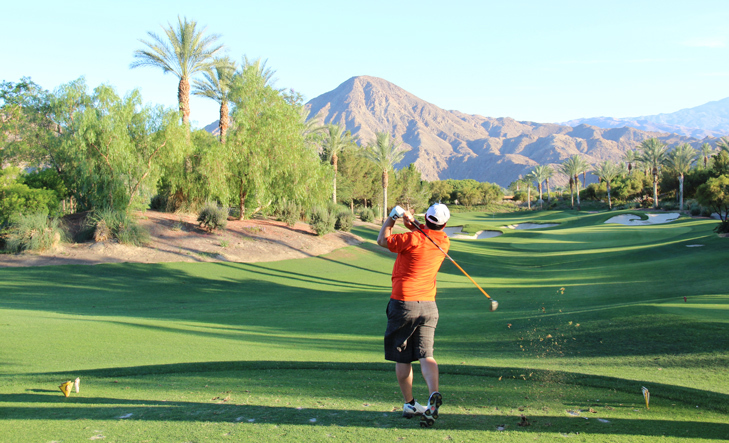 Indian Wells Celebrity Course Hole 12: There is no better scoring opportunity on the course than the short par four 12th. It is straight with no real trouble around the green unless the tee shot goes way right or left. There are bunkers in the fairway to avoid, but either a lay-up or going for the green is equally do-able for a decent shot. Indian Wells Celebrity Course Hole 13: The short par four 13th follows the easy 12th, but this one is far less of a bargain. Only iron is needed off the tee, but there are bunkers left and water down the right. A mammoth tee shot could reach the green, but a small pond lurks about 20 yards right of the green, so discretion is valued here. 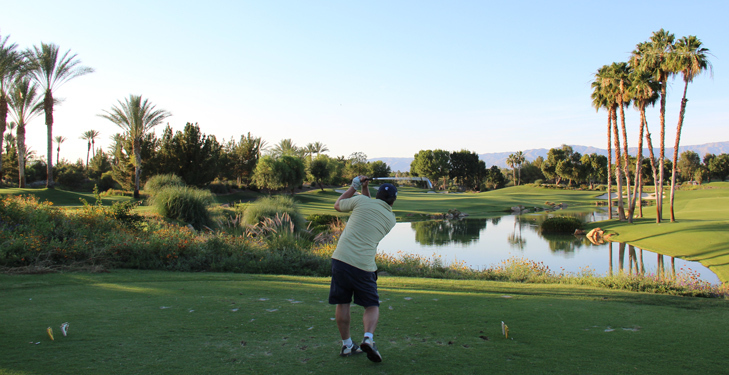 Indian Wells Celebrity Course Hole 14: This par five has a drive that must avoid going right and should also try to avoid the sand traps to the left. There is a creek that splits the fairway about 150 yards from the green so a bad drive can lay-up if needed. There is water, however, that runs down the entire right side from there to a green with only the left third not fronted by the water. 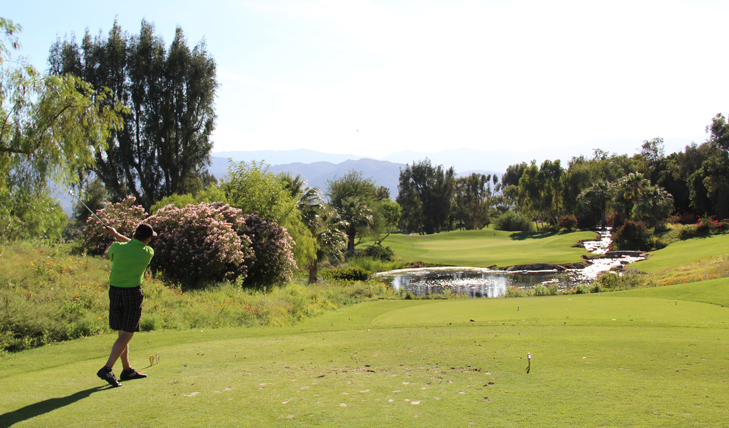 There are also a lot of traps by the green, but the view of the mountain backdrop for a nice shot is a welcome reward. 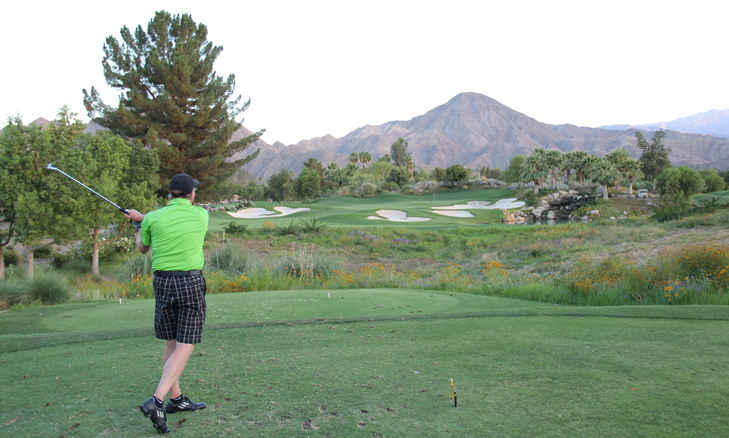 Indian Wells Celebrity Course Hole 15: This is a tough, long par four that requires a couple of decent shots. The fairway is wide, but there are some pesky trees and mounds around the green that can leave tough chips if the putting surface is not reached in regulation. 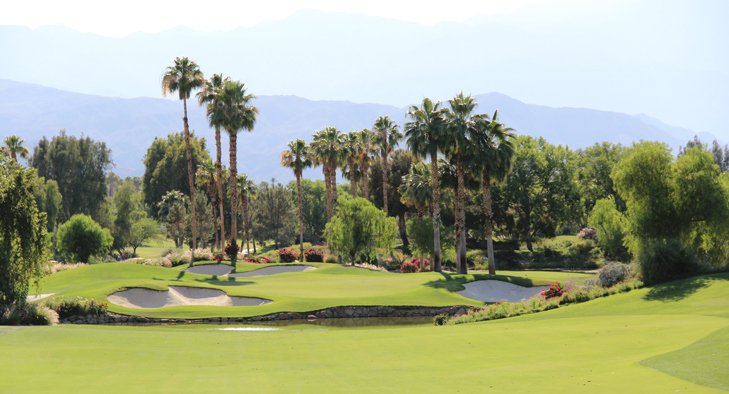 Indian Wells Celebrity Course Hole 16: This par three is the only one on the back nine. 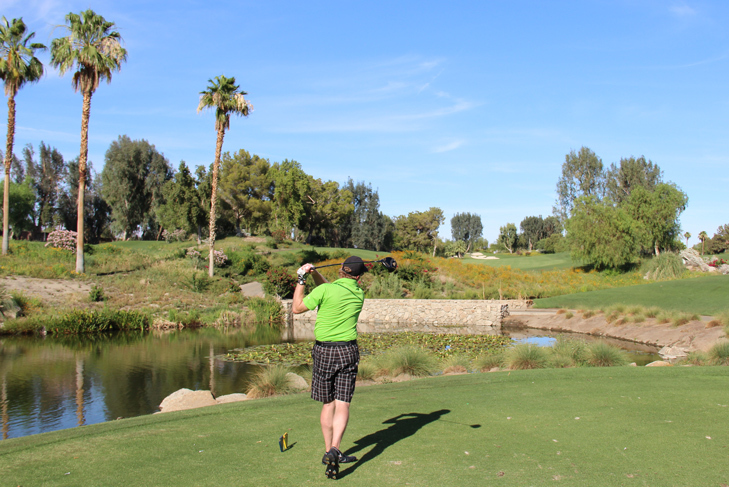 The green is more receptive to a left to right shot, but there is also the water feature short and right of the green. There are also plenty of bunkers to grab an errant tee shot and some mounds long to leave difficult chip shots. Indian Wells Celebrity Course Hole 17: This dogleg right par four has a fairly wide-open drive but a good one is needed as the approach can be tough, especially if the pin is cut center or right, which will find a good shot having to fly the water hazard and the steep slope with bunkers cut out of it. Indian Wells Celebrity Course Hole 18: The last tee shot features water to the left and bunkers right (and OB farther right). 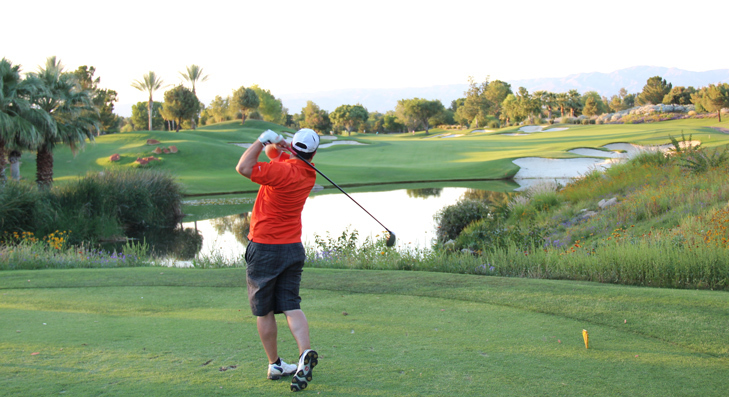 Left-center of the fairway is ideal for the last approach shot of the day, which must clear the water and also avoid it as it wraps left of the green as well. The bunkers and hill long are no bargain either.